Netflix On PS3 Will Remain Disc Based In The Near Future, Before Being Integrated Into The XMB. The Playstation 3 will provide free movie streaming at the cost of a Netflix subscription, substantially cheaper than the XBOX 360 which requires a Live membership too. 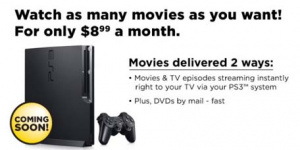 However, the initial launch of Netflix on the Playstation 3 will require a disc to run, while Sony and Netflix work on an XMB upgrade that will allow movie streaming direct from the dash. With many pressing questions regarding the integration, Joystiq took to interviewing the fine folks at Netflix. So, when will Netflix be integrated into the XMB? "Late next year we expect to have an embedded solution available for PS3s via a system software update slated for release through the PlayStation Network." Netflix were quick to describe the disc based roll-out as the "fastest and easiest" way to get things running - presumably in time for the holiday rush. Rest assured Sony and Netflix folks will be working round the clock to get an embeddable version running. For now though, know you can totally get Netflix on your PS3. All you need to do is order this disc for free.